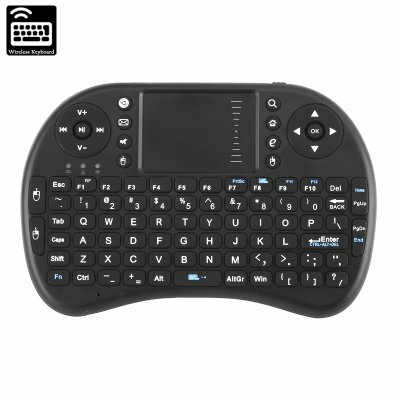 Successfully Added Wireless Mini Keyboard - Portable Design, QWERTY Layout, 92 Keys, Game Controller, Mouse Pad, Adjustable DPI, Wireless Dongle to your Shopping Cart. Easily control your PC or TV Box from the comfort of your sofa with this wireless 91 key keyboard. Featuring a built-in mouse pat and game controller this wireless keyboard holds all the features you need to fully operate your device from afar. With its plug and play design all you have to do is simply plug in the receiver dongle into your PC or TV box and you’ll be all set. With 10 meter’s of range this QWERTY keyboard lets you write documents, play games, or simply browse the web on your PC or TV while sitting comfortably on your sofa. It’s highly sensitive smart mouse-pat allows you to simply browse through your files with the swipe of a finger. Featuring an adjustable DPI you can easily adjust your mouse’s sensitivity to ensure that it suits your working style. Additionally, this portable keyboard also features a built-in game controller, allowing you to enjoy your favorite games on your smart TV or PC and significantly increasing your gaming experience. Featuring an epic 800mAh battery this mini keyboard provides a stunning 2 weeks of usage time. Its smart sleep and wake features further enhance your usage time by automatically putting the device to sleep when it has not been used for 3 minutes. With its innovative design this portable mini keyboard features a shape that can be easily carried around in your pocket and comfortably held in your hands while in use. Thanks to its revolutionary shape and integrated game controller this portable mini keyboard can be used efficiently for both typing documents and playing games alike – making it a truly multifunctional gadget that is a must have for all tech-savvy people out there. This mini wireless QWERTY keyboard comes with a 12 months warranty, brought to you by the leader in electronic devices as well as wholesale electronic gadgets..
Fast delivery. Came as described and fully charged. Easy set up. No complaints.